Church of the Big Sky: Which flavor is best for eternal rest? 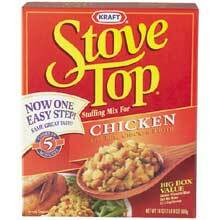 Ruth Siems, the Mother of Stove Top Stuffing, has died at 74. Mrs. Siems will be sauted with butter and water, fluffed with a fork and then lovingly wrapped in crinkly plastic and sealed in a red cardboard box. In lieu of flowers, the family has asked for a nice greenbean casserole and some Ocean Spray cranberry sauce. But in a lovely sorta way. If I laughed (out loud) does that mean I'm going to hell too? Thanks for the chuckle. Well-needed after some heaping helpings of family disfunction earlier today. and yes, you're going to hell for that...but it was SOOOOO GOOOOOODDD!! !